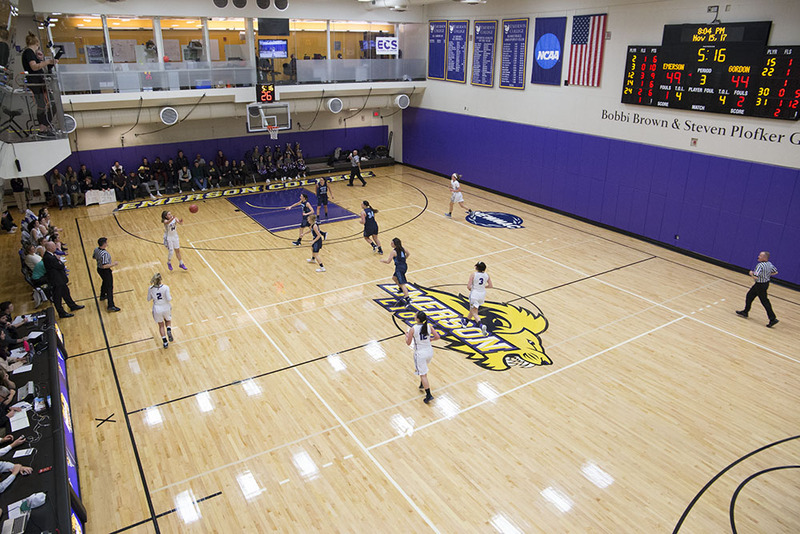 Emerson’s women’s basketball team got 22 points off the bench Wednesday night in its 71-48 loss to the MIT Engineers. The Engineers entered the contest with half of their 14-person roster listed at 5-foot-10 or taller. The Lions have only three players at that size. They raced out to a 16-point lead early in the second quarter after a 15-0 run on a Lions squad who were without with injured starters Charlie Boyle, a 6-foot center, and Natalie Busch for the fourth straight game. Head coach Bill Gould said Charlie Boyle’s absence was clearly felt. Emerson (2-6, 0-3) had a shaky start, committing four turnovers in the first four minutes and going down 10-3 early while running a fast-paced offense. They climbed back with three consecutive baskets to make it a 1-point deficit before MIT made its big run starting at 2:43 in the first and flowing into the second. The second quarter was the Engineers’ best, scoring 26 points to the Lions’ 15. After Natalie Clydesdale’s two free throws for Emerson ended the run at 8:18, Sam Boyle strung together six straight points as part of her team-leading performance. The freshman finished with 12 points on 6-of-15 shooting with nine rebounds and a block. Kate Foultz put in the other two triples. She had eight points. MIT, with the help of 53 percent shooting and points in the paint, roared out to a 46-24 halftime lead. Backups saw solid minutes for the rest of the contest. Freshman Rachel Davey impressed with back-to-back buckets midway through the third quarter, and later made a three-pointer, one of only three for Emerson. She ended with 11 points on 4-of-6 shooting in 16 minutes. The Lions outscored the Engineers 11-7 in the third, but still found themselves down by 18 heading into the fourth. They found minor success with freshman Ashley Toner and Sophia Detweiler, who each scored four points, but the game was out of reach. MIT (4-2, 3-0) scored 59 percent of its points in the paint and picked up 21 off turnovers. Jocelyn Luizzi had a game-high 17 on 50 percent shooting. Emerson hosts Western New England University (4-2) on Saturday.